In preparation of rolling out its newest mobile operating system, Apple has updated its Maps app to include so-called "flyover" data for a number of major cities worldwide, including Philadelphia, Manchester and Toronto. It should be noted that the iPad maker has yet to include New York as one of the 3D-capable cities, possibly over terrorism concerns. New York has yet to receive the flyover treatment in iOS 6 Maps. Apple announced at WWDC 2012 that it would be ditching Google Maps for its own proprietary mapping service borne out of a 2011 acquisition of Swedish 3D mapping company C3 Technologies, a spin-off from Saab's AB defense arm. A recent side-by-side comparison between 3D maps created in iOS 6 and the new function in Google Maps gave a slight edge to Apple's solution in terms of resolution and rendering speed. The new iOS 6 Maps app will feature TomTom-powered turn-by-turn navigation with integrated Siri support, Yelp recommendations and vector-based mapping for fast 2D rendering. 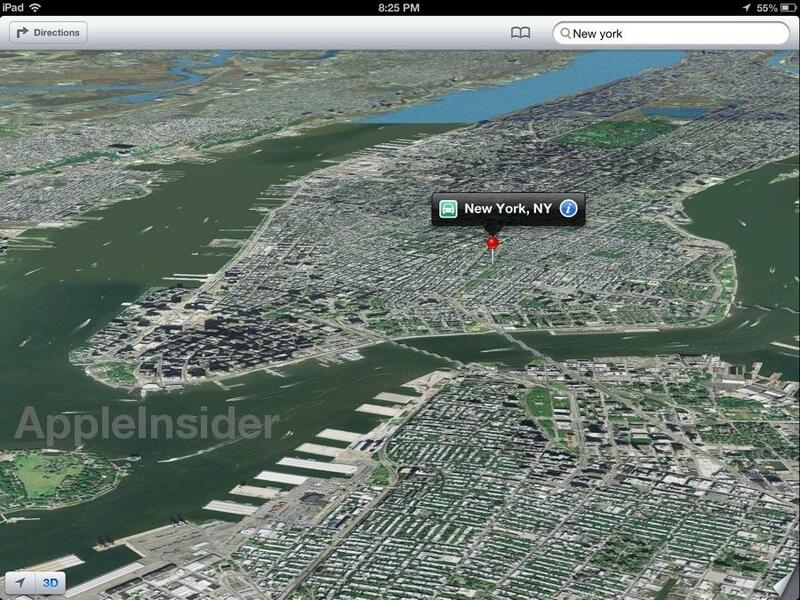 More information on Maps and other new iOS 6 features can be found in AppleInsider's First Look: iOS 6 series.